Highlows pass as patent leathers. 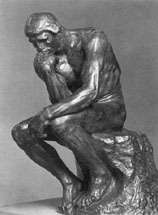 Rodin's The Thinker symbolizes this search for meaningful answers. A jumble of topics appears to the left, with new topics to be added as new thoughts emerge. Also, it is unlikely that any of the topics discussed will ever converge to an unchanging discourse.